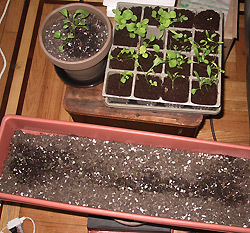 The early days: arugula sprouts in the pot; the tray is half arugula, half flowers. In the windowbox, the peas have just sprouted. I live in Brooklyn now, and once again have a one bedroom apartment all to myself (halleluiah!). Money’s tight, but I’ve been building up an assortment of plants again. In San Francisco I had lots of plants, and even got a couple of them to flower. It helps my mood to have plants around.